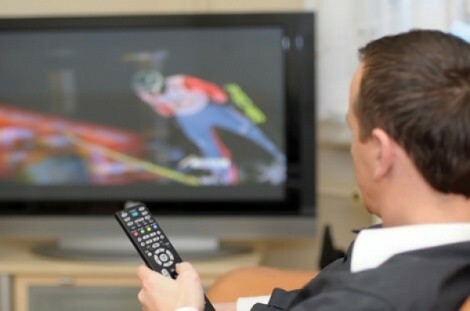 Time on the couch with video can be key to an athlete’s improvement. Are you an active, athletic person who enjoys a particular sport and wishes you could get better at it? Or, more to the point, do you compete and want to beat the competition? While practice is important, and building your body with resistance and cardio work is essential, there’s one element of improvement that many recreational athletes ignore: watching video. On the elite level, “watching the tape” is part of daily training. There are usually two ways this is done. One is when, after practice, a tape of the practice is rolled and the coach gives a running (sometimes embarrassing) critique of everything the athlete is doing. The other is when a tape of another team or a high-level event is run, and the coach shows where someone makes a good move—or a bad one—and points out team tactics or set-ups for plays. The Park City Masters, who include some of the best recreational ski racers in the country, have six-hour training days five days a week at Park City Mountain Resort (though few show up for every available minute of training). They do video work in the morning, getting a coach’s comments during the lunch break. If a racer has the bad habit of letting an arm fall back during a turn, the coach will point this out over and over again. It helps the racer remember to keep that arm forward when he or she is on the mountain again, and many racers say that the daily video is one reason for their top Masters ranking. Some bike clubs go out for group rides and waste an opportunity to record everyone because everyone wants to be in on the ride. In a case where video would be helpful but there’s no one to do it, it’s worth hiring someone; a significant other is perfect. A lack of experience may result in less-than-ideal recording quality at first, but within time, anyone can learn the specific points of taping action. But knowing how to watch a tape is just as important. You don’t just scan the images. Mike Day, one of the world’s top BMX riders who won the silver medal when BMX debuted in the 2008 Beijing Olympics, watches video of both himself and other athletes. “ Usually, I watch video of myself rather than other people. I look at my pedal position, how high the pedal is at a certain spot, how I held my body,” Day says. You can rent, or find online, videos of elite athletes doing almost any sport in the world. Today’s digital video cameras are so inexpensive that it’s worth investing in one to get video of yourself. You can even trade off with another athlete, using an “I’ll record you if you’ll record me” agreement. Make sure the cheap camera you purchase has the ability to transfer video to your computer. Here are some tips on constructive watching that will help you improve athletically. First, watch body parts. If there are people you wish to beat, watch their hands. How do they hold them? Is there a more efficient way to hold them? The position of the head is extremely important—and often ignored—in many sports. Look at the way an elite climber stretches his or her neck when tackling the next problem; use that as a guide for your own climbs. Look at the knees and hips of ski racers as they make a turn; is the outside knee bent in enough to be touching the boot top of the inside leg? Even if you’re not a racer, try assuming that position when you make a turn and see whether it improves your skiing. Watch a recording of an elite event like the Dew Tour and look at how athletes bend their knees or hold their shoulders. Or, if you’re a high school football athlete, look at body positions of NFL players on Monday Night Football. Watch tapes of the essential three—elite athletes, your competition and yourself—and become a better athlete without even moving from the couch.